Fantastic 7s doesn't pretend to be anything more than it is. Click here to play! It's a simple classic 3-reel slots game offering a top prize of 2500 coins when 3 coins are played. It has a single payline and it doesn't use wild symbols, so Fantastic 7s is about as basic a slots game as you are likely to find. While people who like the noise and chaos of 5-reel bonus slots might not like that, not everyone needs bright colors and lots of combinations in order to keep their attention. Some players prefer slots to be straightforward and easy to follow. 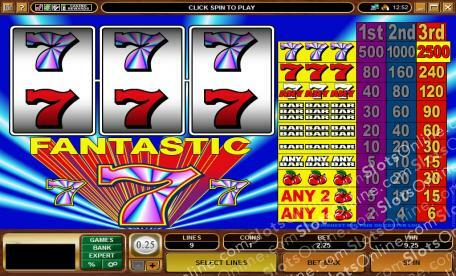 In Fantastic 7s, the pay table is always on the screen and there is only 1 payline to keep track of. Also, the symbols used are red cherries, BAR, double BAR, triple BAR, red sevens, and the extra lucky rainbow 7s. These are widely used symbols in many classic slots games, meaning seasoned 3-reel slots veterans will hardly ever need to refer to the paytable to know how they've won. If you simply like to place a bet and have a spin on the slots, and you don't need flashy gimmicks to keep yourself involved, then Fantastic 7s shouldn't disappoint.